An oddball of the Tanki Online world, Dictator is one of the more unique hulls the game has to offer. A medium hull that borders the realm of the heavies, Dictator has high torque, mountains of health, and an unusually tall stature. This vantage point is what makes this hull stand out from others, as a turret mounted on this hull can fire over obstacles that other tanks would deem insurmountable. Couple that with the turret's placement on the rear of the tank, and many advantages for hiding locations and firing positions become readily available. However, unless you're crawling around in a Ping-Pong, a mid- to long-ranged weapon does best on Dictator, as it's the slowest of the medium hulls and has a fairly poor acceleration speed. Protection (hp) — tank's health. Damage dealt by a turret is subtracted from a tank's protection. Once the protection gets to zero, the tank explodes. Top speed (m/sec) — maximum speed the tank can get to on a straight. Lateral acceleration (m/sec²) — responsible for damping of lateral speed. The less this parameter is, the easier tank can drift. The higher it is, the more difficult it is for a tank to move sideways. Weight — affects tank's stability, i.e. 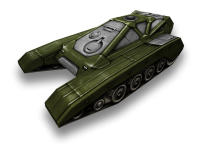 impact force of hits, recoil of its own turret, and partly, ability to move other tanks (this parameter does not affect tank's speed). Power (m/sec²) — affects the time it takes a tank to get to its maximum speed and ability to push other tanks. Reverse acceleration (m/sec²) — anti-inertial acceleration that comes into force when a tank is moving in one direction and a player presses the button of moving to other direction. It works until speed gets to zero. After that, usual acceleration starts working.